Big Rock festival, penmaenmawr Sat, April 29th. One for the diary..Snowdonia challenge 100km walking over 3 days. June 30-July 2nd. Waves, mud and mountains is taking place on march 26th at Surf Snowdonia, Dolgarog, Conwy valley. Surf Snowdonia will be hosting their festival this year Electric wave festival between July 14-16th. FREE things to do in North Wales through the year, courtesy of The daily post. Three weeks to go until Surf Snowdonia opens! They have a two for one offer to kick start the season off. Anglesey Circuit events page released for its 2017 Season. Check out their page for more. The Daily Posts 18 things to add to add to your Bucket list 2017 in North Wales. Head to their website to check out more.. The Daily Posts 19 more FREE things to do in North Wales. Head to their website to check out more..
Anglesey SeaZoo is opening this weekend! just a quick reminder to all that Anglesey Seazoo is opening for the season this weekend, make sure you pop in and say hello if your passing. Ahead of the half term break, the Daily Post has published a fantastic guide “Things to do with the kids this February Half term” have a look here! 45 Cool things to do in North Wales on your half Term Holiday. Another great article by the Daily Post. Llanberis Adventure & Mountain Film Festival -C/o Raw Adventures, Caban Cyf, Brynrefail, Gwynedd, LL55 3NR. 3-5 March 2017. 18:00-23:45. Tel: 07980 770561. Brewery Jazz at 3rdspace, featuring Trefor Owen, Great Orme Brewery, Builder Street, Llandudno, Conwy, LL30 1DR. 19:00-23:00. Tel: 01492 330680. Miller and more, The Classic sound of swing, Theater Colwyn, Colwyn Bay, Conwy, LL297RU. Feb 17th 19:30-21:30. Tel : 01492577888. March Manouche, A weekend of Gipsy Swing and Jazz music- Menai Bridge, various venues March 17-19. Aim High Events Anglesey Half Marathon- Menai Bridge, 05 March 2017. Dragons Dash Juniors race, Menai Bridge 9:20am. Ash Dykes, Presentation and talk Surviving Madagascar – Galeri, Vic Doc, Caernarfon, Gwynedd. March 31, Friday 19:30. Kendal Film Festival Tour – Galeri, Vic Doc, Caernarfon, Gwynedd. Feb 17th, Friday 19:30. Happy Valentines! 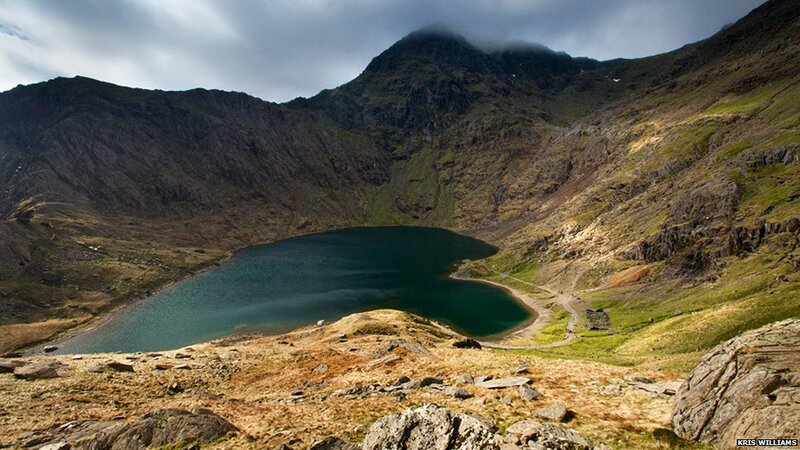 Top three Valentines restaurants in North Wales to fine dine in..
You only get heart shaped lakes in Snowdonia! Image courtesy of Kris Williams and the BBC.